Clean and pat dry fish fillets with paper towel. Season fish fillets on both sides with the listed seasonings A (except for cornstarch) for 15 munutes. Set aside. Heat large frying pan with olive oil and butter over medium fire. Sprinkle cornstach on both sides of the fish fillets. Place fillets in the pan to sauté till both sides are cooked and browned. Adjust fire to low-medium, if fillets are large and thick. Dish up. Clean the same frying pan, heat with olive oil and butter. Place mushrooms scatteredly in the pan and lightly brown them. Do not crowd the mushrooms in the pan. Brown the mushrooms in batches, if necessary. Then, brown the onions. Transfer the sautéed mushrooms and onions into a pot away from stove, add in milk. Use a handheld blender to blend the mushroom mixture well. Bring the pot back on stove over low heat, stir in the listed seasoning B (except for corn starch slurry). Bring the pot to a light boil. Add in corn starch slurry to thicken the sauce. Heat off. Laddle sauce and pour it on the fillets. Garnish and serve together with any other side dishes. 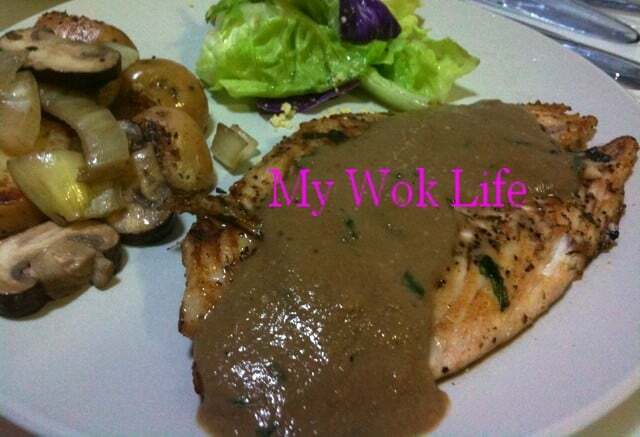 A generous serving of my grilled fish fillet topped with Asian mushroom sauce counts roughly around 320kcal. It’s pretty healthy! Tips: Browning of mushrooms is not a must, but it will elevate the aroma and flavour of the sauce, if done so. * Use of handheld or electrical blender, simply transfer the mushrooms and onions into the electrical blender and add in milk to blend well. Then, transfer into the pot for boiling on stove. * Sauté the fresh Basil leaves till crisped for a more aromatic garnishing, if desired. Otherwise, may use the pre-bottled chopped dried Basil leaves instead. Simply sprinkle some on the serving. This is certainly a great recipe for special occassion like anniversary/ Vday where one can have a DIY romantic candlelight dinner at home, thanks for sharing!